In November of 2014, our team completed construction on a large garden-scale bioshelter in Greenfield, Massachusetts. The 700-square foot structure was designed to provide year-round growing space for annual and perennial vegetables, figs, fish, and hens. A bioshelter is a high-performance greenhouse that uses the sun to power a lush and warm indoor ecosystem populated with useful plants, small livestock, and even fish. People have been experimenting with season extension in glasshouses for hundreds of years, but most of these enclosed systems require a great quantity of energy and material inputs to keep temperatures moderate and pests at bay. In the mid-seventies, the designers at the New Alchemy Institute coined the term ‘bioshelter’ to describe a new type of greenhouse as intentionally designed ecosystem. These solar-powered systems use natural venting and thermal mass to balance the temperature and interconnected communities of plants and animals to maintain the health of crops. Experimentation and innovation in bioshelter design has continued slowly over the last 30+ years but the increasing popularity in backyard gardening and uncertain weather in recent years has led to an explosion of interest. RDG has been working to help farmers and avid gardeners eager to create bioshelters in the Connecticut River Valley and greater New England. The region’s cold winters require careful attention to the structure’s insulation and passive solar design. 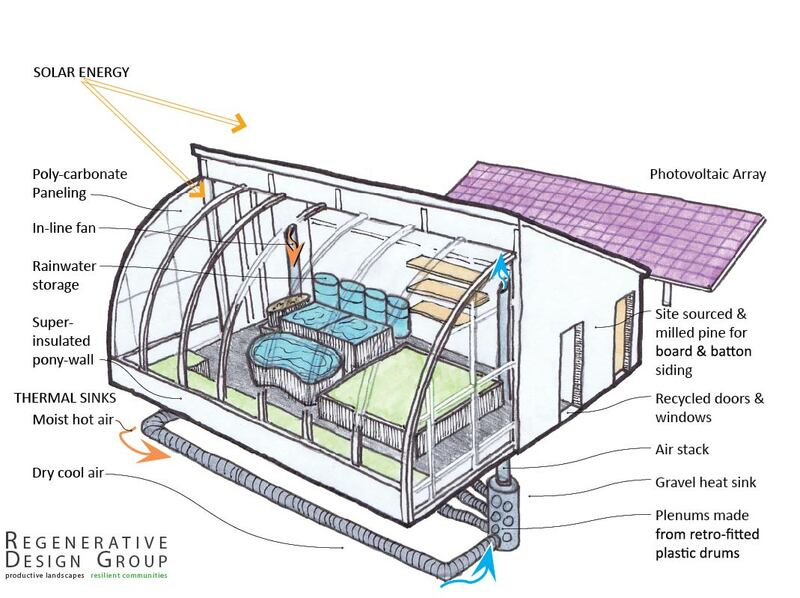 To protect the tender members of the ecosystem from below-freezing conditions, this bioshelter integrated an inexpensive geothermal system called a climate battery into the literal foundation of the structure. All electricity for the bioshelter is produced by the ground mounted PV array behind the structure creating a zero-net-energy system. During long winters, like the one we just experienced in the Northeastern U.S., an ecosystem like this can supply food and serve as a life-saving sub-tropical vacation in the back yard. Collaborators on this project included Thom Barry, Architect & Builder and Jonathan Bates at Food Forest Farm. previous post: Wildside Cottage and Garden- New Website!